Being a scavenger can be a rough life if you're stuck here on Earth. There just aren't enough droids on this planet to make a decent profit! Maybe its high time you join the best scavengers in the universe, the Jawas, and start scavenging on a planet with more to offer. All you need to do is get to Tatooine with your resume and you'll be set to join these noisy little aliens. Be ready to learn a lot from the Jawas, they've been scavenging for generations. One way you can impress your new co-workers is by already wearing their traditional apparel, and we can help you with that before you travel to a galaxy far, far away. 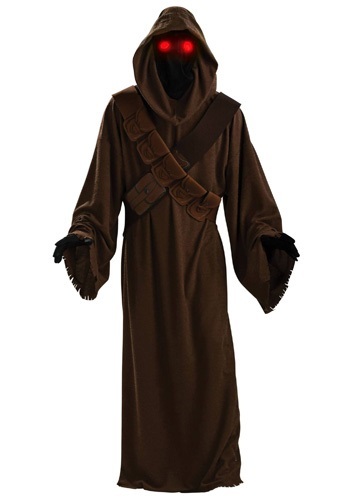 With this Tatooine Jawa Costume we can guarantee that you'll fit right in, the drastic height difference will hardly even be noticeable! The Jawas are constantly at the mercy of the elements, the dual suns and a planet full of sand sure can make life hard for these little guys but they have adapted and learned to work around these odds. The brown robe that comes with this costume is designed to match those of the Jawas and will protect you from the harsh weather of Tatooine. Be sure to keep with the Jawas' tradition of never removing their hoods, otherwise you'll stand out like a droid in the Mos Eisley Cantina, and you'll probably end up with a face full of sand, that stuff just gets everywhere...its like nature's glitter! Well, we've offered all the help we can to aid you in your promising career as a scavenger. Make sure to learn a few common phrases in Jawaese as well! We hear that their language can be hard to get a hang of at first, but we have faith in you! Baka la jaka! Pretty sure that translates to good luck! This was great. While not many recognized as a Star Wars character once it got dark the eyes spooked out everyone.